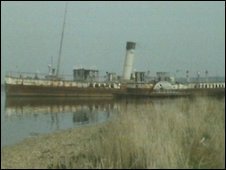 Restoration work has begun on a paddle steamer that made its name during the Dunkirk evacuations of World War II. The Kent-based Medway Queen brought more than 7,000 troops back to Britain. But after 60 years the vessel's hull is in need of a total rebuild. A £1.86m Heritage Lottery Fund grant will pay for the work to the vessel known as "The Heroine of Dunkirk". Work on her flooring and bulkheads has started in Bristol and it is expected to be fully assembled by the summer. She has been a pleasure craft, a wartime minesweeper and a floating nightclub.